Send a bouquet mindful of tropical islands. 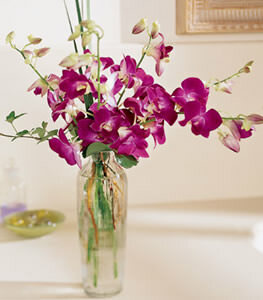 This glass vase is filled with purple dendrobium orchids and exotic greens. Perfect for celebrating a special day, or for day-dreaming about distant isles. Note: This item may require 24+ hours notice in some areas.